According to James Tyberonn, engineer and geologist, the Sedona vortexes function as one of the 12 Sacred Portals on the Earth because of its cosmic alignment and intensity of magnetic earth energies. Tourists visit Sedona seeking and asking, Where are the vortexes? So do vortexes exist? If they exist what are they? Native Americans, as well as local residents, recognize the Sedona vortexes. They claim these vortexes to be electromagnetic in nature. Ben Lonetree, an electrical engineer, studied and monitored the magnetic fluxes in Sedona Arizona with a magnetometer. He conducted measurements of earth magnetic anomalies and their effect on human brainwaves. After 10 years of scientific research he states, Intense electromagnetic activity exists in Sedona. 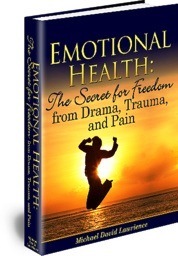 He found his subjects experienced healing, shifts in consciousness, and a sense of well-being. 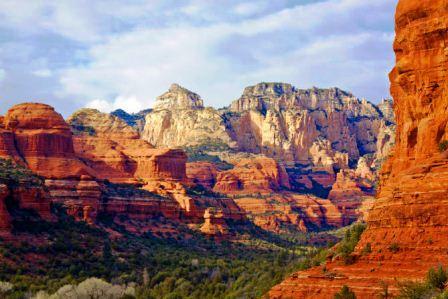 Magnetic energy from the core of the Earth rises to the surface throughout the Sedona vortexes. A 2003 US Geological Survey confirmed through aerial magnetic surveys the presence of a lot of magnetic anomalies over Sedona. All the pink on the map shows the magnetic areas of Sedona. Below the surface of Sedona lie layers of basalt volcanic rock, limestone formed from shellfish, sandstone with iron oxide and quartz. Quartz creates its own magnetic field. Also the magnetic energy of the earth, as it comes upwards to the surface of Sedona, gets focused through the iron oxide and quartz as upflows of energy. 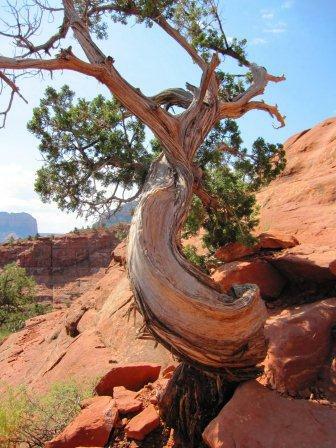 Ben Lonetree measured upflows emerging as vortexes of spinning whirling energy in some areas of the Sedona vortexes and then spinning back into the ground – inflows – 200 to 300 feet away. Pete A. Sanders, M.I.T. scientist, and Richard Dannelley in their works Scientific Vortex Information and Sedona Power Spot Vortex, respectively, also labeled vortexes according to the direction of their energy flow as upflows and inflows. 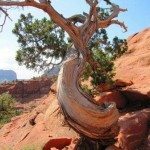 Lonetree demonstrated that the Sedona Vortexes affected brainwaves. The magnetic fields created more alpha/theta brainwaves which produce relaxation and assist meditation. He postulated that the earth magnetic fields can be detected by magnetite in our inner ear fluid which then sends electrical impulses to our brain. It has been shown that women have 80% more magnetite which has a quality of magnetism. This gives women a natural ability to sense subtler energies. Regardless, men can also sense subtler energies by quieting their minds and focusing their attention inward. Upflows of magnetic energy assist expansion of consciousness and the setting of clear conscious intents in our lives and projecting them outward for manifestation. On the other hand, inflows assist in grounding the energies in our bodies for greater health, as well as going deep into our emotional issues to receive more information and for self-healing. As the US Geological Survey shows, all of the Sedona area is one hugh vortex, as indicated by the pink color. In addition, various vortex sites can be classified by the residents of Sedona as well as scientific research, as primary upflow or inflow areas. Each of the main vortex sites, however, contains additional upflow and inflow areas throughout the site. My experience as well as that of other hiking tour guides validates this. 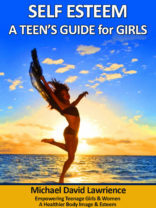 Greater anchoring/grounding for better health. At the least, you will probably experience some peace and relaxation and a connection to the beauty of nature. 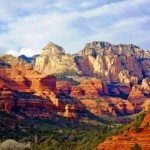 Check out http://sedonamysticaltours.com for more information about tailor made hiking tours for your visit to Sedona.